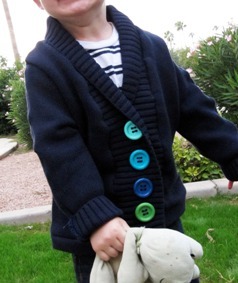 Heidi from HoneyBear Lane shares a tutorial on her blog showing how to make a kid’s cardigan out of an adult-sized sweater. She was inspired by similar sweaters from Janie and Jack. I’m loving the deep ribbing around the neck and front! She and Amy from The Idea Room entered this project into Round 1 of Crafting With The Stars. Go to the tutorial.